Simply being of perfect proportions alone cannot be said to equate to true beauty. It is when rationality and intellect exudes to reveal also the heart and soul that true beauty is universally acknowledged and a woman can be adored. The Miss Japan Association refers to such women as 'Kokoro-bijin' or 'A Beauty With a Heart'. Finding a woman who possesses the balance between both physical beauty and that of the heart and soul, is one of the key deciding factors in the selection of the Miss Japan Award Winners. The finalists that emerge from the regional preliminary contests spend the following half-year focusing on 'heightened gracefulness' and ‘heightened sensibilities’. Additionally, the Finalists are required to attend special training on Japanese culture, politics and economics etc. and become ‘further culturally refined’. Please do aim to become ‘Miss Japan’ and lead the way in becoming a leader. We find beauty in people who make an effort to change society for the better. Our goal is to send someone with ‘true beauty’ out into the world… beauty in inner strength, looks and actions. In the past, what defined a Japanese woman’s beauty were consideration for others and a gentle manner. In present times, another attribute is on the list… the ability and enthusiasm to take action. We want the women who enter the Miss Japan Contest to learn how to achieve their wholesome dreams. So, we provide programs for them to broaden their horizons and realize their abilities. To the woman who keeps on trying to achieve her dreams with strength and beauty, we award the title of Miss Japan. 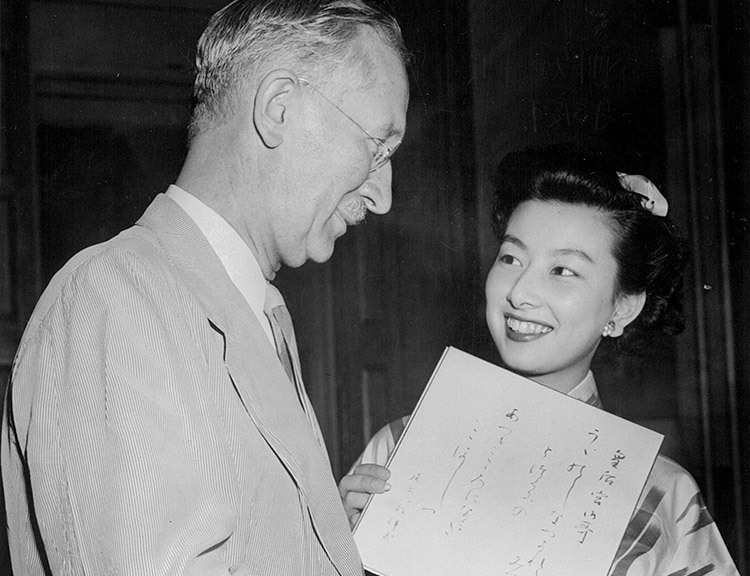 The beginnings of the 'Miss Japan Contest' stretch back to the period immediately following the end of the Pacific War. At that time in Japan, food, clothing and shelter were all in short supply and many children were suffering from malnutrition. It was the American ‘Licensed Agencies for Relief in Asia’ that came to the rescue with mostly the supply of powdered skim milk amongst other foodstuffs and clothes. The organization was abbreviated to LARA and was known here in Japan as ‘LARA-Bushi (LARA-aid)’, and played a major role in the post-war recovery of Japan. Due to this, in a July 1947 plenary session of the House of Representatives, an urgent resolution of expression of gratitude was unanimously passed by the House. The result of that contest to find the Goodwill Ambassador to the United States, i.e. the first Miss Japan, was the crowning of Ms. Fujiko Yamamoto, who later became a successful actress and who also became known for being synonymous with a Showa Era (1927-1989) beauty. Her‘unyielding acuteness hidden beneath a soft demeanor’or‘dignified elegance’is the new standard of beauty for Japanese women. 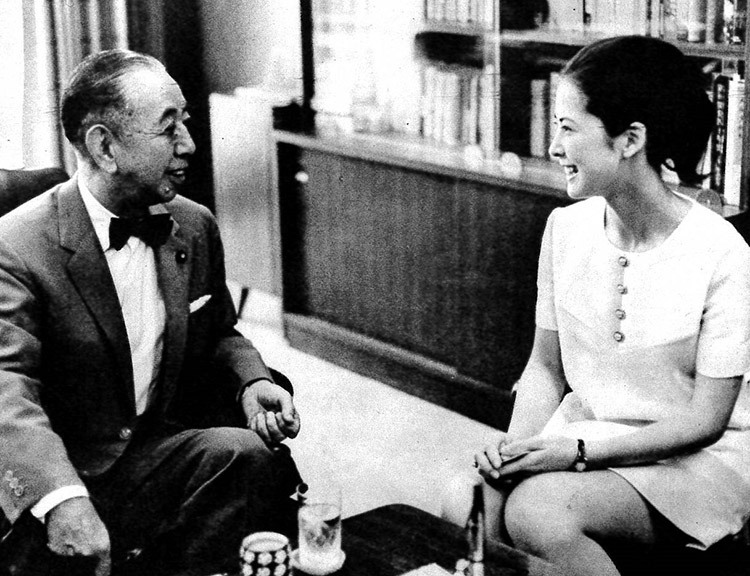 The Miss Japan Contest was held in 1952, and Ms. Keiko Hibino received the title. But after that, the contest sponsored was for a while put on hiatus, and the sponsorship by Yomiuri Shimbun ended here. The Contest was revived in 1967 by Shizuo Wada, the representative of Wada Laboratory. Shizuo Wada was an advocate of lean figure, health and beauty. He was also the man who put into practice the ‘Wada Figuring Formula,’ which led him into the spotlight as a well-known television health and beauty exercise instructor. Then in 1970, in preparation for the holding of the Japan World Exposition (Osaka Expo), Shizuo Wada was assigned to deliver a personal letter from the then Prime Minister Nobusuke Kishi to each nation, which proved to be helpful in opening the way to the holding of the exposition. Japan has held beauty contests since the Meiji Era (1868-1912), although they were solely selected from photographs based upon their good looks. However, as the nation became more westernized, the concept of beauty shifted more towards the physique and many beauty contests placed their selection emphasis on a well proportioned woman. Amongst this trend, the first differentiating feature of the Miss Japan selection focuses on ‘attractiveness’, ‘nicely proportioned figure’, but additionally on being ‘culturally refined’ and ‘the beauty of heart and soul’. These are principles that reflect the spirit of the very first contest and are strictly adhered to and respected. Furthermore, the secondary differentiating feature of the Contest is that the contest is not a step to an international beauty contest but rather that it is concluded within Japan and the crown is offered as a representation of the ‘Foremost Beauty of All Japanese Women’. 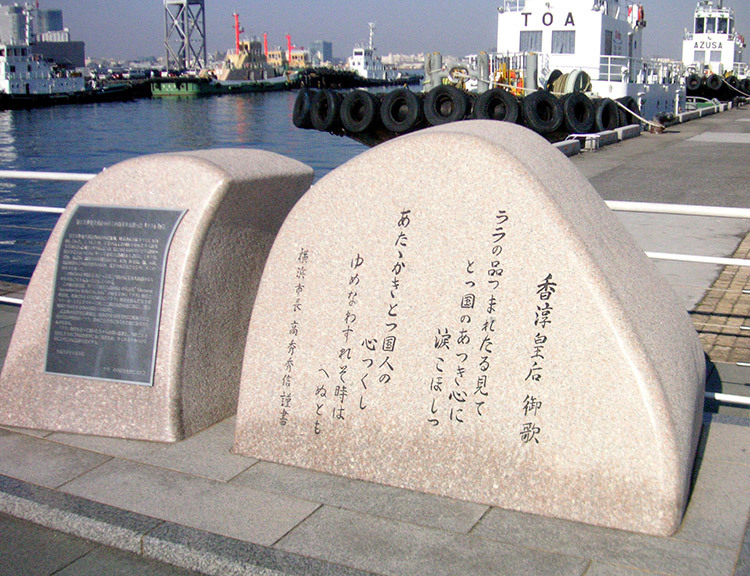 The memorial monument of LARA with the engraving of the Japanese traditional poetry read by Empress Kojun at the Port of Yokohama. Miss Japan Fujiko Yamamoto delivering a Japanese traditional poem from Japan's Empress. She was entrusted with the message of thanks to hand to US Governors. 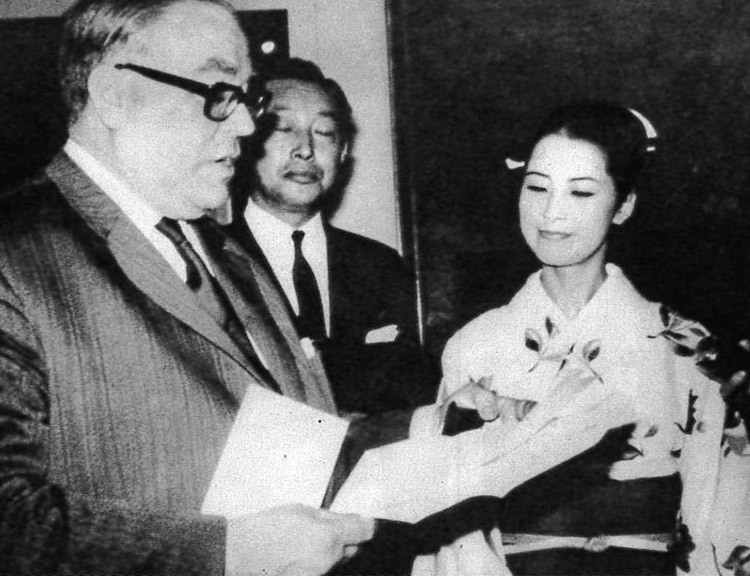 Miss Japan receiving a letter of thanks to pass on to the US from former Prime Minister Nobusuke Kishi. Miss Japan Noriko Suzuki as an envoy for the Japan World Exposition. She met with mayors around the world. Copyright © Wada Laboratry all rights reserved.